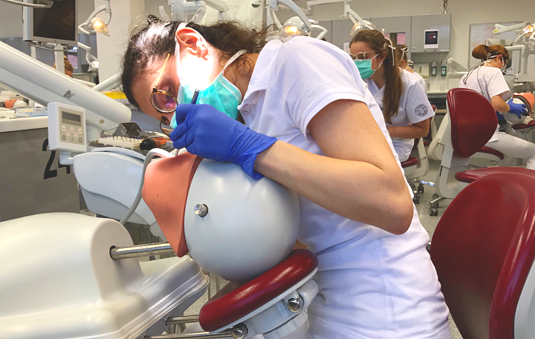 In LMU‘s Dental School patients can choose to be treated by students – under expert supervision. That option takes a little longer, but it has distinct advantages. Raya picks up the filling material with the spatula, takes a quick look in the patient’s mouth, and skillfully manoeuvers the bolus into the cavity, tamping it down so that it snugly fills the hollow. She doesn’t really need the mask and gloves she has on. Her patient is made of plastic, and its neck ends in a steel rod. But these practice sessions are designed to be realistic. Simulations are a routine part of the course for the 60-70 dental students like Raya, who hone their skills on plastic patients every day. “The study of dentistry is very practice-oriented,” says Professor Reinhard Hickel, Director of LMU’s Outpatient Clinic for Conservative and Operative Dental Surgery and Dean of the Faculty of Medicine at LMU. “The course has the highest number of practical hours per week – more than medical students have to do,” he adds. Budding dentists need to acquire practical experience early on. Unlike medical students, dental students are permitted to treat patients during their training. So if your teeth are giving you any trouble, you can simply make an appointment with the clinic in Munich’s Goethestrasse 70. You don’t need a referral. And if you have no objections, the necessary work will be carried out by student dentist under the supervision of an experienced practitioner. To ensure that they can provide the care one would expect in a normal dental practice, each team of six students works under the supervision of at least one fully qualified dental surgeon. These expert professionals provide aid and advice in difficult cases, and they perform the more complicated operations. That’s why this treatment option takes a little longer – and that in turn explains why students, housewives and pensioners make up much of the clientele. “There are benefits for the patient also, because every detail of the treatment is explained and carefully monitored,” Hickel says. This is particularly comforting for many patients who suffer from dental anxiety. Indeed, surveys indicate that two-thirds of all patients are prone to dental anxiety – and one in every seven has a pathological fear of dentists. “Furthermore, patients pay significantly less for many of the treatments which are not covered by statutory health insurance schemes,” says Hickel. The pronounced emphasis placed on practical skills during their studies enables newly qualified dentists to set up their own practices as soon as they graduate, without having to undergo further specialized study. However, as a rule, they work for at least two years as junior dental surgeons before obtaining their health insurance accreditation. In the planned nationwide curriculum for dental students, the supervision ratio will be reduced from 6 to 3, which promises to reduce waiting times for both students and patients. As it now stands, the Outpatient Clinic in Munich already has an enviable reputation. The foundation for its success was laid 12 years ago when the whole building was upgraded, both structurally and technically. With a modernized interior and the latest technology, new opportunities in teaching and research have opened up. “In many areas, we have a very good reputation worldwide.” Indeed, Hickel himself is a member of several international commissions in his field, and has given lectures at countless universities in Europe, America and Asia. Before he became Dean of LMU’s Medical Faculty, he had served for many years as an Honorary Professor in the US. Hickel believes that dentistry in Germany is in good shape. Although millions of teeth are extracted every year, great strides have been made in preventive care, where dentistry has set an example for other medical specialties. “Forty years ago, 75% of those over 65 wore dentures”, he says. – But that has since changed dramatically. The numbers of fillings and crowns needed has also fallen. This does not mean that regular visits to the dentist will soon be a thing of the past. Researchers at King‘s College London have recently shown in mice that it is possible to fill cavities by implanting stem cells in the dental pulp. But as Hickel points out, this process takes months in humans, and growth of a new tooth requires several years. Apart from the costs involved, it will take decades before this approach becomes routine. “In my view, significant advances in the biology of tooth culture can be expected in around 20 years or so,” he says.